The PTS002 Classic Series TV cart is CNYF's best selling universal TV cart for commercial use in offices, schools, hotels, airports, laboratories, lobbies, hospitals, and more. Travel lightly to and from tradeshows and conferences with this versatile and compact TV cart. It fits flat panel TVs from 32" - 70" weighing up to 50kg. Compatible with all major TV manufacturers, the carts hold standard VESA sizes up to a maximum of 600x400. The quality black finish matches most flat screen TVs in their home or office environment. Specifications:Fits most screens from32" - 70".Supports up to 50kg. Steel Materia.VESA Compliant 600x400 . If you have any questions about this product by CNYF, contact us by completing and submitting the form below. If you are looking for a specif part number, please include it with your message. 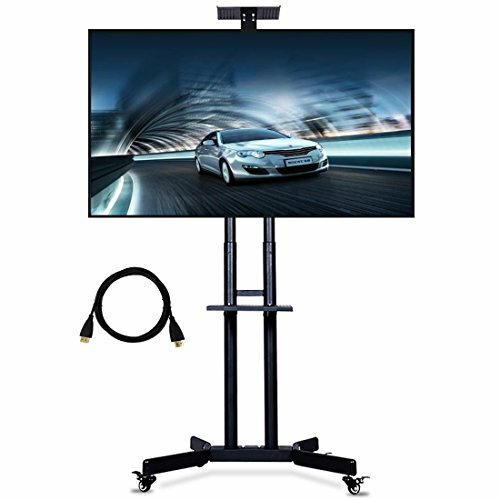 CO-Z Mobile TV Cart for LCD LED Plasma Flat Panel Stand Mount with Lockable Wheels Mobile fits 32" to 65"